I'll start this off by saying that I don't know enough about the old Citroen market to say whether the asking price for this Citroen is reasonable. As I've written so many times in the past, the goal of this blog is not to sell cars, but to point out interesting, fun, cool, forgotten and / or unique cars. The "little cyber car show", as I like to call it. 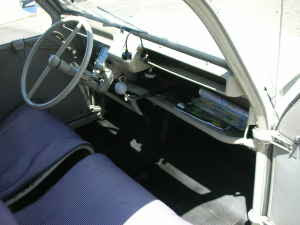 The Truckette was, obviously, based on the 2CV. According to Citroen Concours of America Inc. (which is, in my mind, the definitive website for Citroens in the US) "very few, if any, Truckettes were imported by Citroen". Most were privately imported by enthusiasts. This Truckette has been restored. 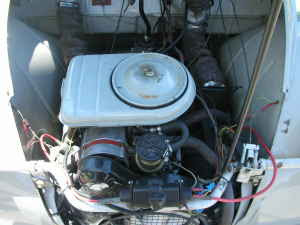 It has a new larger engine (602cc vs. the original 435cc), new paint, new tires, brakes, etc. 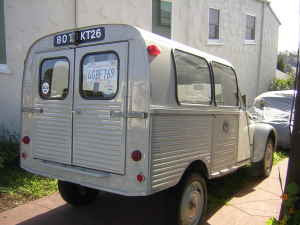 It appears to be as nice of a Citroen Truckette as you'll find in the US. 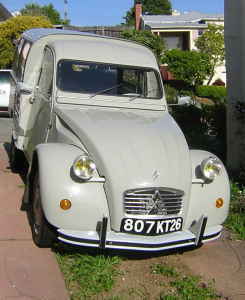 During its 42 year run, Citroen built almost 9,000,000 2CVs (of all varieties). Parts are easy to come. This is a Craigslist ad and has only 4 pictures. The vehicle is being offered at top dollar. As I said in the opening, I don't know enough about Citroen prices to say if the $20K asking price is realistic, but, as my dad used to say, "you get what you pay for", and in this case you may be getting the nicest Truckette in the US. Located in Oakland, CA, click here to see the Craigslist ad. In the spirit of full disclosure and all that type of stuff, the link to this Truckette was sent to me by JaCG reader, Peter, who knows the people who are selling it. He wrote "These folks are as honest as the day is long and their Truckette is immaculate". I based some of my description on what he wrote in his e-mail. The Citroen Truckette makes an appearance in the film The Return of The Pink Panther. In one hilarious scene, Clouseau tries to stop the vehicle, only to discover the brakes don't work - he tries to pull on the e-brake but the lever breaks off in his hand and he just throws it out. He eventually drives into a swimming pool and hilarity ensues. Oddly enough, one of these was parked on/near my block in SF for a few months. Seems to have disappeared, hopefully into a dry garage. It was bright yellow. "P" - One of the great scenes in a great movie. I'm a huge "Old" Pink Panther fan.